This set is guaranteed to spark childrens' imaginations to build a wide variety of settings, models and characters. In addition to bricks in all sorts of colours, it includes special elements such as spiders, snakes, wands, pots, roast chickens, flowers, treasure chests, transparent elements and much more! 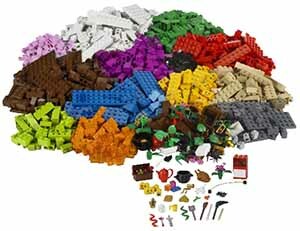 The set is also great for adding that extra something to your existing LEGO System sets. Download free activities on www.LEGOeducation.com.